The choice of Scylla versus Charybdis is a hard one. Do you knowingly cause the death of 6 crewmembers in order to save the rest? Or do you risk all their lives in the hopes of saving all their lives? What is interesting is that when I pose this question to my students they all immediately have the same reaction: Scylla…logically. It is more logical to lose 6 crewmembers than all of them. They stick with Scylla even when I clarify that they are choosing to intentionally and knowing kill 6 people so the rest can live…noble sacrifice they say. The needs of the many outweigh the needs of the few. The light begins to dawn when one of them asks, “Do we get to pick who those six are or does Scylla pick?” The prospect of being one of the six promotes a reevaluation of the situation. If you were one of the 6 designated as Scylla-bait, maybe the idea of attempting Charybdis doesn’t seem like too bad of an idea. Often this myth is discussed as an example of a no-win scenario, in order to teach people that sometimes there is no right answer. But I believe this is the wrong way to read it. The choice between Scylla and Charybdis is not about the difficulty of certain choices. It is about the fact that in the midst of making difficult choices, every one of us would prefer to choose Scylla but we should choose Charybdis. We are the captains of our lives. When we encounter difficult straits, we would rather throw 6 dead bodies overboard and move along. Scylla provides us an opportunity to avoid risk or change or labor but at the cost of doing wrong. We lie, steal, cheat, or kill in order to maintain the course of our lives. Charybdis requires courage to risk everything we hold dear. But it keeps our souls intact. It sounds like your students need to watch more Stargate and less Star Trek :). Leave no man behind! Perhaps I’m too literal, but this story leaves too many questions unanswered to be an effective analogy. Without knowing the crew size and the probability of total destruction from Charybdis, how can you make a decision? If the crew size is 6 or under, you’d be better off facing Charybdis. As crew size increases Scylla becomes a better option even with a relatively low risk from Charybdis if the crew size is significant (risk * crew size > 6). Anyway, found this site by googling “Jack Bauer is evil”. 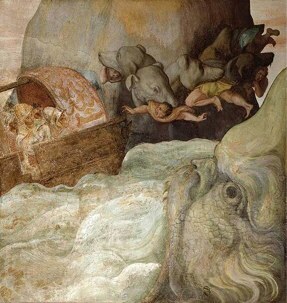 Another option: realize Scylla and Charibdis is a myth, and sail right on. Nice write up, I first learned of these in a literature class I took at San Jac back in 1968 or so. I Googled “sail between Scylla and Charybdis” to find your blog. I plan to check it out and perhaps learn some more. Now that I’m retired. Just a note, I had application papers to teach at SBU but then I never sent them back. After a first career in Aerospace Engineering I then taught Business Law for 22 years at San Jac, then I retired in 2001. Scylla and Charybdis is probably related to the classic Greeks’ emphasis on balance and the golden mean. Not a choice between Fear and Courage. Aristotle wrote of the golden mean. So, the way through the middle between Scylla and Charibdis is Courage, while to one side is Cowardice and to the other side is Recklessness. Is that perhaps in Aristotle’s Ethics?